What a delight to find a children’s book that breaks with the norm, and shows another side to the age of ‘chivarly and knights.’ It never occurred to me, until I read this very humorous book by Jones, that in some ways, we glorify knights and war, and forget that in the end, it is still war. Without hitting us over the head with a moral hammer, Jones takes us on the adventure of a boy who longs to travel with the Knights. We discover, through his eyes, just how dreadful it really can be. The stunning moment (Spoiler) comes when the boy, who has learned to love to read, watches an entire library go up in flames. His comment is worth sharing here: “He had always known, without thinking, that death was a part of war. The thing he had not been prepared for was the destruction of ideas.” A very, very potent and powerful statement, worth reading the whole book for. In addition to being a sobering look at misguided dreams of heroism, this children’s book has so much good humor that it’s hard to not love it. The author inserts himself and addresses today’s reader, reminding us that we are reading history. At the same time, he makes history come alive in many small and great ways. I am so happy I stumbled on this children’s book. 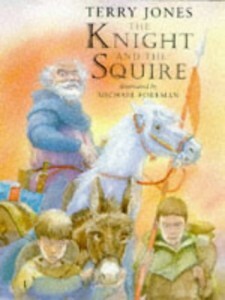 There is a sequel called The Lady and the Squire, that I’m looking forward to reading. This book is now on my list of “highly recommend.” It’s an out-of-print book but easy to get used copies for it.